In Japan, native religious beliefs and practices, commonly called Shinto, flourished and evolved even after the introduction of Buddhism in the sixth century. The beliefs trace back to ancient times, and shrines dedicated to the gods called kami remain an important part of communal life. Ancient accounts say the kami created the Japanese islands, and they reside in natural features of the land. Important kami, although unseen, live in shrines. Believers pray to kami to protect households, celebrate births and marriages, and ask for prosperous harvests. Like Buddhist deities, kami help in times of illness or disaster, though Buddhist ceremonies are usually held for the deceased. Kami enjoy music, processions, and entertainments, and many festivals are still held annually today. 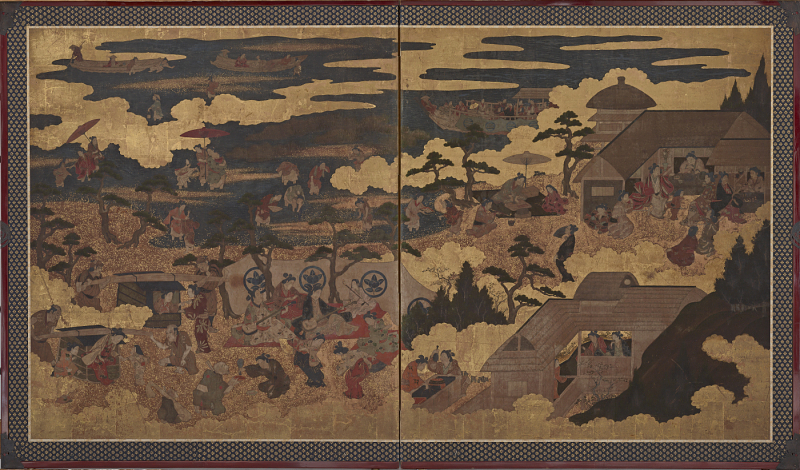 The screens in this gallery depict such celebrations during the Edo period (1615–1868), when their festivals included horse races, boating parties, and picnics, enjoyed by a broad sector of Japanese society.